As humanity continues to pump carbon into the sky, the models that predict Earth’s future are becoming increasingly complex and detailed. And yet, they’re zeroing in on a simple conclusion: if we don’t get our act together fast, Florida is totally screwed. Along with a bunch of other coastal cities around the world. 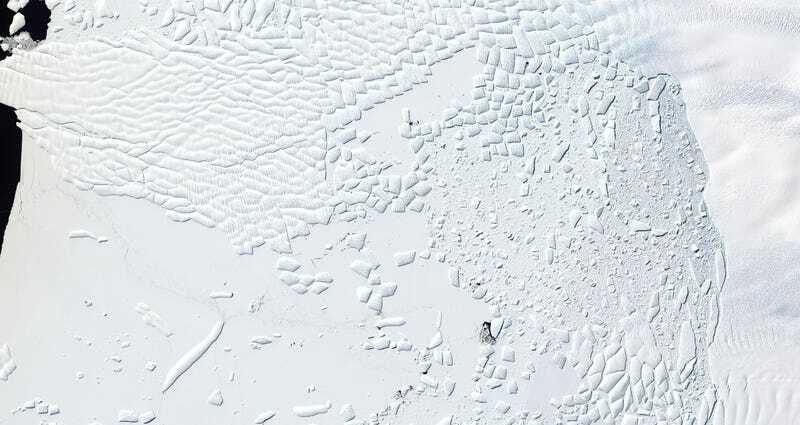 A major new ice sheet analysis, which appears as the cover story in Nature today, offers the latest dire warning that we are on the brink of dramatic and essentially irreversible sea level rise. The key finding is that the Antarctic ice sheet may be extremely sensitive to a couple degrees of warming, much more so than we thought. The authors conclude that if carbon emissions continue unchecked, Antarctic melting alone could cause more than a meter of sea level rise this century and 15 meters (50 feet) by the year 2500. An illustrative map of Miami under a 20 foot sea level rise-scenario. Blue indicates regions underwater. Image: Climate Central. Over a meter of sea level rise would turn Miami, New Orleans, and other US cities that sit at sea level into giant wading pools. But it gets a lot worse if you start looking further into the future. In their study, DeConto and David Pollard incorporated several new physical feedback processes into Antarctic ice models. These include the accumulation of meltwater on icy surfaces, and the collapse of cliffs that hold back the flow of inland ice into the ocean. The result? A few degrees of warming may cause tremendous amounts of ice—particularly in the West Antarctic Ice Sheet—to fall and melt into the sea over centuries to come. Unfortunately for humans, the results line up very nicely with what geologists believe happened during the last interglacial period 125,000 years ago, when the planet was maybe a degree or two warmer than it is today, but global mean sea level was up to 60 feet higher. Even the best models can’t forecast the future with 100 percent certainty. But the predictions laid out in this study align closely with several other recent papers, including one led by Ken Caldeira of the Carnegie Institution that appeared in Science Advances last fall. That study concluded Antarctic melting could drive 30 meters (98 feet) of sea level rise over the next thousand years if we don’t temper our appetite for fossil fuels. “It looks to me like our studies are very much in accord,” Caldeira told Gizmodo in an email. A study published in PNAS last fall looked at what would happen to US coastal cities if sea level rose ten meters, and found that six large cities in Florida and two in Louisiana would be totally submerged. Given that DeConto’s worst case scenario is quite a bit worse, we can only assume that more cities will be added to the list if his projections are borne out. It’s looking increasingly likely that the citizens of Florida are going to have to be permanently resettled to large luxury cruise ships (probably their preference) or the Moon (not a terrible idea). Or, we could enact policies that’ll promote a rapid shift to renewable energy sources—our best shot at preventing our coastlines from drowning. The scientists will continue to tinker with their models, but the choice before us has never been clearer. This post has been updated to include Dr. Ken Caldeira’s comment.